The Cambodian Civil War (Khmer : សង្គ្រាមស៊ីវិលកម្ពុជា) was a military conflict that pitted the forces of the Communist Party of Kampuchea (known as the Khmer Rouge) and their allies the Democratic Republic of Vietnam (North Vietnam) and the Viet Cong against the government forces of the Kingdom of Cambodia and, after October 1970, the Khmer Republic, which were supported by the United States (U.S.) and the Republic of Vietnam (South Vietnam). The People's Army of Vietnam, also known as the Vietnamese People's Army (VPA), is the military force of the Socialist Republic of Vietnam. The PAVN is a part of the Vietnam People's Armed Forces and includes: Ground Force, Navy, Air Force, Border Defence Force, and Coast Guard. However, Vietnam does not have a separate Ground Force or Army branch. All ground troops, army corps, military districts and specialised arms belong to the Ministry of Defence, directly under the command of the Central Military Commission, the Minister of Defence, and the General Staff of the Vietnam People's Army. 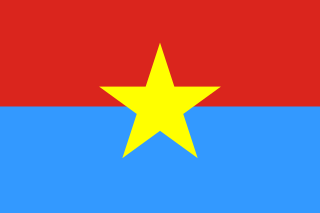 The military flag of the PAVN is the flag of the Socialist Republic of Vietnam, with the words Quyết thắng added in yellow at the top left. Children were widely used during and after the war, often being persuaded or forced to commit atrocities. The Cambodian government estimated that more than 20 percent of the property in the country had been destroyed during the war. In total, an estimated 275,000–310,000 people were killed as a result of the war. By the late 1960s, Sihanouk's delicate domestic and foreign policy balancing act was beginning to go awry. In 1966, an agreement was struck between the prince and the Chinese, allowing the presence of large-scale PAVN and Viet Cong troop deployments and logistical bases in the eastern border regions. He had also agreed to allow the use of the port of Sihanoukville by communist-flagged vessels delivering supplies and material to support the PAVN/Viet Cong military effort in South Vietnam. These concessions made questionable Cambodia's neutrality, which had been guaranteed by the Geneva Conference of 1954. The majority of middle-class and educated Khmers had grown weary of the prince and welcomed the change of government. They were joined by the military, for whom the prospect of the return of American military and financial aid was a cause for celebration. Within days of his deposition, Sihanouk, now in Beijing, broadcast an appeal to the people to resist the usurpers. Demonstrations and riots occurred (mainly in areas contiguous to PAVN/Viet Cong controlled areas), but no nationwide groundswell threatened the government. In one incident at Kampong Cham on 29 March, however, an enraged crowd killed Lon Nol's brother, Lon Nil, tore out his liver, and cooked and ate it. An estimated 40,000 peasants then began to march on the capital to demand Sihanouk's reinstatement. They were dispersed, with many casualties, by contingents of the armed forces. Lon Nol hoped to use the Vietnamese as hostages against PAVN/Viet Cong activities, and the military set about rounding them up into detention camps. That was when the killing began. In towns and villages all over Cambodia, soldiers and civilians sought out their Vietnamese neighbors in order to murder them. On 15 April, the bodies of 800 Vietnamese floated down the Mekong River and into South Vietnam. 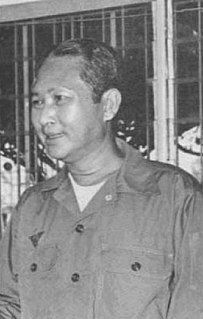 The North Vietnamese reacted to the political changes in Cambodia by sending Premier Phạm Văn Đồng to meet Sihanouk in China and recruit him into an alliance with the Khmer Rouge. Pol Pot was also contacted by the Vietnamese who now offered him whatever resources he wanted for his insurgency against the Cambodian government. Pol Pot and Sihanouk were actually in Beijing at the same time, but the Vietnamese and Chinese leaders never informed Sihanouk of the presence of Pol Pot or allowed the two men to meet. Shortly after, Sihanouk issued an appeal by radio to the people of Cambodia to rise up against the government and support the Khmer Rouge. In doing so, Sihanouk lent his name and popularity in the rural areas of Cambodia to a movement over which he had little control. In May 1970, Pol Pot finally returned to Cambodia and the pace of the insurgency greatly increased. After Sihanouk showed his support for the Khmer Rouge by visiting them in the field, their ranks swelled from 6,000 to 50,000 fighters. It was not until 20 August that FANK launched Operation Chenla II, its first offensive of the year. The objective of the campaign was to clear Route 6 of enemy forces and thereby reopen communications with Kompong Thom, the Republic's second largest city, which had been isolated from the capital for more than a year. The operation was initially successful, and the city was relieved. The PAVN and Khmer Rouge counterattacked in November and December, annihilating government forces in the process. There was never an accurate count of the losses, but the estimate was "on the order of ten battalions of personnel and equipment lost plus the equipment of an additional ten battalions." The strategic result of the failure of Chenla II was that the offensive initiative passed completely into the hands of PAVN and the Khmer Rouge. On 12 April, concluding that all was lost, the U.S. evacuated its embassy personnel by helicopter during Operation Eagle Pull. The 276 evacuees included U.S. Ambassador John Gunther Dean, other American diplomatic personnel, Acting President Saukam Khoy, senior Khmer Republic government officials and their families, and members of the news media. In all, 82 U.S., 159 Cambodian, and 35 third-country nationals were evacuated. Although invited by Ambassador Dean to join the evacuation (and much to the Americans' surprise), Prince Sisowath Sirik Matak, Long Boret, Lon Non (Lon Nol's brother), and most members of Lon Nol's cabinet declined the offer. All of them chose to share the fate of their people. Their names were not published on the death lists and many trusted the Khmer Rouge's assertions that former government officials would not be murdered, but would be welcome in helping rebuild a new Cambodia. After the Americans (and Saukam Khoy) had departed, a seven-member Supreme Committee, headed by General Sak Sutsakhan, assumed authority over the collapsing Republic. By 15 April, the last solid defenses of the city were overcome by the communists. In the early morning hours of 17 April, the committee decided to move the seat of government to Oddar Meanchey Province in the northwest. Around 10:00, the voice of General Mey Si Chan of the FANK general staff broadcast on the radio, ordering all FANK forces to cease firing, since "negotiations were in progress" for the surrender of Phnom Penh. The war was over but the sinister plans of the Khmer Rouge were about to come to fruition in the newly proclaimed Democratic Kampuchea. Long Boret was captured and beheaded on the grounds of the Cercle Sportif and a similar fate would await Sirik Matak and other senior officials. Captured FANK officers were taken to the Monoram Hotel to write their biographies and then taken to the Olympic Stadium where they were executed. :192–3 Khmer Rouge troops immediately began to forcibly empty the capital city, driving the population into the countryside and killing tens of thousands in the process. The Year Zero had begun. General Sosthène Fernandez was the Commander-in-Chief of the Khmer National Armed Forces (FANK) and chief of general staff of the Khmer Republic after Prince Sihanouk was deposed as head of state in 1970. Prior to 1970, he was a prominent politician and a former chief of the police. Operation Menu was the codename of a covert United States Strategic Air Command (SAC) bombing campaign conducted in eastern Cambodia from 18 March 1969 until 26 May 1970 as part of both the Vietnam War and the Cambodian Civil War. The targets of these attacks were sanctuaries and Base Areas of the People's Army of Vietnam and forces of the Viet Cong (NLF), which utilized them for resupply, training, and resting between campaigns across the border in the Republic of Vietnam. The impact of the bombing campaign on the Khmer Rouge guerrillas, the PAVN, and Cambodian civilians in the bombed areas is disputed by historians. The Khmer National Armed Forces, often abbreviated to FANK, were the official armed defense forces of the Khmer Republic, a short-lived state that existed from 1970 to 1975, known today as Cambodia. 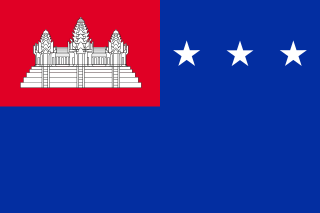 The FANK was the successor of the Royal Khmer Armed Forces which had been responsible for the defense of the previous Kingdom of Cambodia since its independence in 1954 from France. Long Boret or Long Boreth was a Cambodian politician who served as Prime Minister of the Khmer Republic from December 26, 1973, to April 17, 1975. Highly regarded for his honesty, he tried unsuccessfully to negotiate a peace settlement with the Khmer Rouge during the Cambodian Civil War. He was later arrested by the Khmer Rouge and executed. He is one of two Prime Ministers to die in office, the other being Chan Sy. 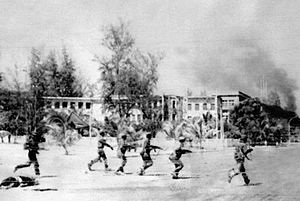 Operation Chenla II or Chenla Two was a major military operation conducted by the Khmer National Armed Forces (FANK) during the Cambodian Civil War from 20 August until 3 December 1971. Operation Chenla I or Chenla One was a major military operation conducted by the Khmer National Armed Forces (FANK) during the Cambodian Civil War. It began in late August 1970 and ended in February 1971, due to the FANK High Command's decision to withdraw some units from Tang Kauk to protect Phnom Penh after Pochentong airbase was attacked. The Sihanouk Trail was a logistical supply system in Cambodia used by the People's Army of Vietnam (PAVN) and its Viet Cong (VC) guerillas during the Vietnam War (1960–1975). Between 1966 and 1970, this system operated in the same manner and served the same purposes as the much better known Ho Chi Minh Trail which ran through the southeastern portion of the Kingdom of Laos. The name is of American derivation, since the North Vietnamese considered the system integral to the supply route mentioned above. U.S. attempts to interdict this system began in 1969. Operation Freedom Deal was a United States Seventh Air Force interdiction and close air support campaign waged in Cambodia between 19 May 1970 and 15 August 1973, as an expansion of the Vietnam War, as well as the Cambodian Civil War. Launched by Richard Nixon as a follow-up to the earlier ground invasion during the Cambodian Campaign, the initial targets of the operation were the base areas and border sanctuaries of the People's Army of Vietnam (PAVN) and the Viet Cong (VC). As time went on most of the bombing was carried out to support the Cambodian government of Lon Nol in its struggle against the communist Khmer Rouge. The area in which the bombing took place was expanded to include most of the eastern one-half of Cambodia. The bombing was extremely controversial, and led the US Congress to pass the War Powers Resolution. The following lists events that happened during 1975 in Cambodia. 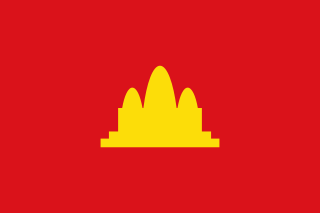 Project Copper was a coordinated military action undertaken by the Kingdom of Laos and the Khmer Republic from 1 January–May 1971. It used U.S. Department of Defense (DOD) funds channeled through the Central Intelligence Agency to train three Cambodian battalions to interdict the Sihanouk Trail before it joined the Ho Chi Minh Trail. Committed to battle in southern Laos on 1 January 1971, one battalion deserted the battlefield, a second one mutinied during training, and a third had to be repurposed after suffering 80 casualties. By late January, the project was temporarily suspended. 1 2 "Global security – Cambodia Civil War". Archived from the original on 21 January 2017. Retrieved 20 December 2016. 1 2 3 4 5 6 Spencer C. Tucker (2011). The Encyclopedia of the Vietnam War: A Political, Social, and Military History. ABC-CLIO. p. 376. ISBN 978-1-85109-960-3. Archived from the original on 12 April 2018. Retrieved 5 December 2017. ↑ Sarah Streed (2002). Leaving the house of ghosts: Cambodian refugees in the American Midwest. McFarland. p. 10. ISBN 0-7864-1354-9. Archived from the original on 12 April 2018. Retrieved 5 December 2017. ↑ Heuveline, Patrick (2001). "The Demographic Analysis of Mortality in Cambodia". Forced Migration and Mortality. National Academy Press. pp. 103–104. ISBN 9780309073349. Subsequent reevaluations of the demographic data situated the death toll for the [civil war] in the order of 300,000 or less. ↑ Banister, Judith; Johnson, E. Paige (1993). "After the Nightmare: The Population of Cambodia". Genocide and Democracy in Cambodia: The Khmer Rouge, the United Nations and the International Community. Yale University Southeast Asia Studies. p. 87. ISBN 9780938692492. An estimated 275,000 excess deaths. We have modeled the highest mortality we can justify for the early 1970s. 1 2 Sliwinski, Marek (1995). Le Génocide Khmer Rouge: Une Analyse Démographique. Paris: L'Harmattan. pp. 42–43, 48. ISBN 978-2-738-43525-5. 1 2 "Cambodia: U.S. Invasion, 1970s". Global Security. Archived from the original on 31 October 2014. Retrieved 2 April 2014. 1 2 3 Dmitry Mosyakov, "The Khmer Rouge and the Vietnamese Communists: A History of Their Relations as Told in the Soviet Archives," in Susan E. Cook, ed., Genocide in Cambodia and Rwanda (Yale Genocide Studies Program Monograph Series No. 1, 2004), p54ff. Available online at: www.yale.edu/gsp/publications/Mosyakov.doc "In April–May 1970, many North Vietnamese forces entered Cambodia in response to the call for help addressed to Vietnam not by Pol Pot, but by his deputy Nuon Chea. Nguyen Co Thach recalls: "Nuon Chea has asked for help and we have liberated five provinces of Cambodia in ten days."" 1 2 3 Southerland, D (20 July 2006). "Cambodia Diary 6: Child Soldiers — Driven by Fear and Hate". Archived from the original on 20 March 2018. Retrieved 28 March 2018. 1 2 Isaacs, Hardy and Brown, p. 83. 1 2 Lipsman and Doyle, p. 127. 1 2 Isaacs, Hardy and Brown, p. 85. 1 2 Isaacs, Hardy and Brown, p. 86. 1 2 Lipsman and Doyle, p. 130. 1 2 Chandler, p. 166. 1 2 Sutsakhan, p. 32. 1 2 3 Isaacs, Hardy and Brown, p. 90. ↑ Clymer, Kenton (2004), United States and Cambodia: 1969–2000, Routledge, pg. 12. ↑ Shawcross, pps. 68–71 & 93–94. ↑ Clymer, Kenton (2013). The United States and Cambodia, 1969–2000: A Troubled Relationship. Routledge. pp. 19–20. ISBN 9781134341566. ↑ Alex J. Bellamy (2012). Massacres and Morality: Mass Atrocities in an Age of Civilian Immunity. Oxford University Press. p. 200. 1 2 Owen, Taylor; Kiernan, Ben (October 2006). "Bombs Over Cambodia" (PDF). The Walrus: 62–69. Archived (PDF) from the original on 24 October 2013. Retrieved 21 April 2014. Kiernan and Owen later revised their estimate of 2.7 million tons of U.S. bombs dropped on Cambodia down to the previously accepted figure of roughly 500,000 tons: See Kiernan, Ben; Owen, Taylor (26 April 2015). "Making More Enemies than We Kill? Calculating U.S. Bomb Tonnages Dropped on Laos and Cambodia, and Weighing Their Implications". The Asia-Pacific Journal. Archived from the original on 18 September 2016. Retrieved 19 September 2016. ↑ Valentino, Benjamin (2005). Final Solutions: Mass Killing and Genocide in the 20th Century. Cornell University Press. p. 84. ISBN 9780801472732. 1 2 Rodman, Peter, Returning to Cambodia Archived 18 May 2013 at the Wayback Machine , Brookings Institution, 23 August 2007. ↑ Chandler, David 2000, Brother Number One: A Political Biography of Pol Pot, Revised Edition, Chiang Mai, Thailand: Silkworm Books, pp. 96–7. "The bombing had the effect the Americans wanted—it broke the communist encirclement of Phnom Penh. The war was to drag on for two more years." ↑ Timothy Carney, "The Unexpected Victory," in Karl D. Jackson, ed., Cambodia 1975–1978: Rendezvous With Death (Princeton University Press, 1989), pp. 13–35. ↑ 1933–, Chandler, David P. (David Porter), (2000). A history of Cambodia (3rd ed.). Boulder, CO: Westview Press. p. 204. ISBN 0813335116. OCLC 42968022. 1 2 3 4 5 6 Lipsman and Doyle, p. 144. ↑ David P. Chandler, The Tragedy of Cambodian History, New Haven CT: Yale University Press, 1991, p. 231. ↑ Szalontai, Balázs (2014). "Political and Economic Relations between Communist States". In Smith, Stephen Anthony (ed.). Oxford Handbook in the History of Communism. Oxford: Oxford University Press. p. 316. 1 2 Karnow, p. 608. 1 2 Isaacs, Hardy and Brown, p. 108. ↑ General Creighton Abrams, commander of the Military Assistance Command, Vietnam dispatched General Conroy to Phnom Penh to observe the situation and report back. Conroy's conclusions were that the Cambodian officer corps "had no combat experience...did not know how to run an army nor were they seemingly concerned about their ignorance in the face of the mortal threats that they faced." Shaw, p. 137. 1 2 Sutsakhan, p. 89. ↑ Etcheson, Craig (1984). The Rise and Demise of Democratic Kampuchea. Westview. p. 118. ISBN 0-86531-650-3. 1 2 Isaacs, Hardy and Brown, p. 106. 1 2 Isaacs, Hardy and Brown, pp. 106–107. 1 2 3 4 5 Isaacs, Hardy and Brown, p. 107. ↑ Ideology was not all that separated the two communist groups. Many Cambodian communists shared racially based views about the Vietnamese with their fellow countrymen. Deac, pp. 216, 230. 1 2 Becker, Elizabeth (1998). When the war was over: Cambodia And The Khmer Rouge Revolution. Public Affairs. p. 160. ISBN 9781891620003. ↑ Kirk, Donald (14 July 1974). "I watched them saw him 3 days". Chicago Tribune . ↑ Kirk, Donald (14 July 1974). "Khmer Rouge's Bloody War on Trapped Villagers". Chicago Tribune. ↑ Yates, Ronald (17 March 1975). "Priest Won't Leave Refugees Despite Khmer Rouge Threat". Chicago Tribune. ↑ Power, Samantha (2002). A Problem From Hell. Perennial Books. pp. 98–99. ↑ Becker, Elizabeth (28 January 1974). "The Agony of Phnom Penh". The Washington Post. ↑ Barron, John; Paul, Anthony (1977). Murder of a Gentle Land. Reader's Digest Press. pp. 1–2. ↑ Ponchaud, François (1978). Cambodia Year Zero. Holt, Rinehart and Winston. pp. 6–7. ↑ Swain, John (1999). River of Time: A Memoir of Vietnam and Cambodia. Berkley Trade. 1 2 Coalition to Stop the Use of Child Soldiers (2001). "Global Report on Child Soldiers". child-soldiers.org. Retrieved 16 May 2018.